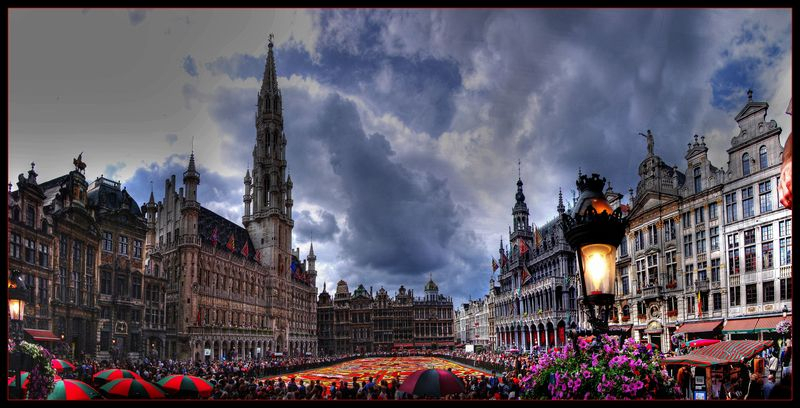 The Market Square is really not spiteful. 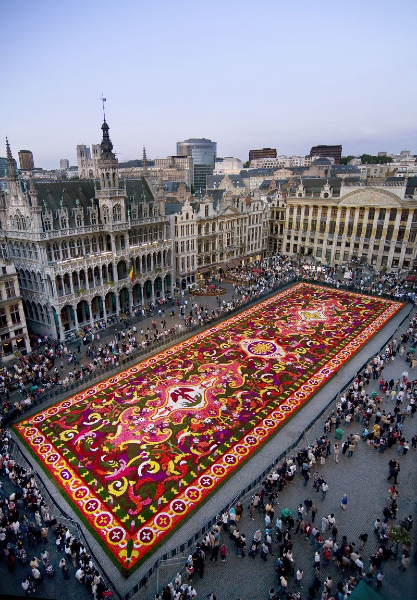 This summer, the magnificent design of its Flower Carpet has drawn inspiration from 18th century French patterns. And yet, it was the armies of Louis XIV that had bombed the city in 1695, destroying 5,000 houses! But one must not confuse art with war. 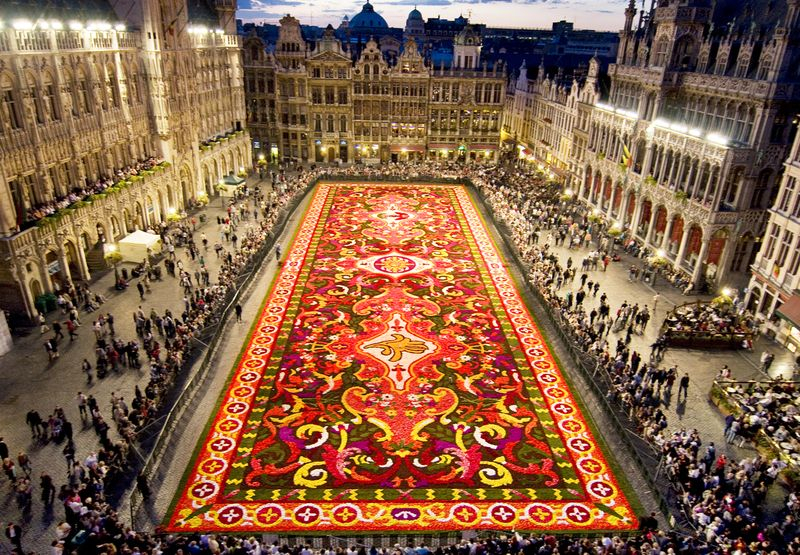 The history of French tapestry is unique. Why did it develop so rapidly and with such talent shortly after 1600? Because the ceaseless conflicts of the age made all trade with the East quite chancy, even very risky. The kings of France supported important local workshops, where craftsmen mastered the complex and intertwined patterns in palettes of glistening colours. Their products went immediately to grace the immense reception rooms of royal palaces whose official emblems they bore. 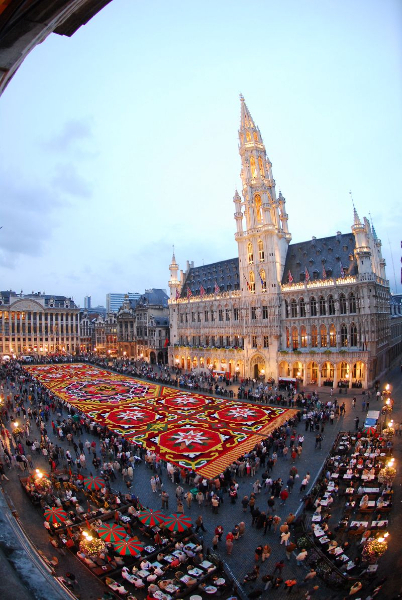 Like the fleur-de-lys, which is happily related to the famous symbolic iris of Brussels. But also garlands of roses and acanthus leaves, evocations of fruits and horns of plenty…. An abundant composition that will leave no-one indifferent. For just three days and four nights only, an enchanted crowd will come to admire this exceptional and ephemeral creation. All the more so, as it can be photographed and filmed from the balcony of the Town Hall, every day, from 9:00 AM to 11:00 PM. And that is not all! 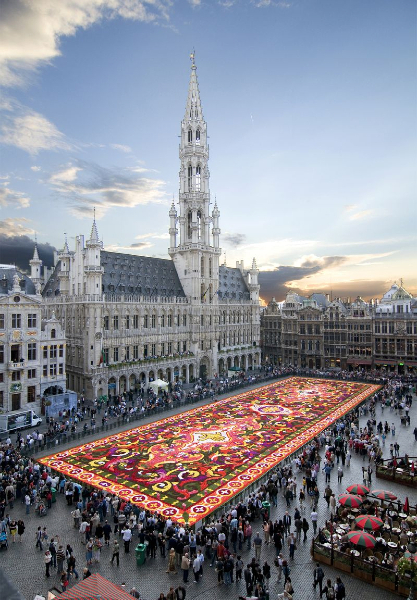 To underscore even better this ephemeral work of art, a prestigious exhibition will feature some ten carpets with a floral theme, of inestimable value, in the public halls of that same building. 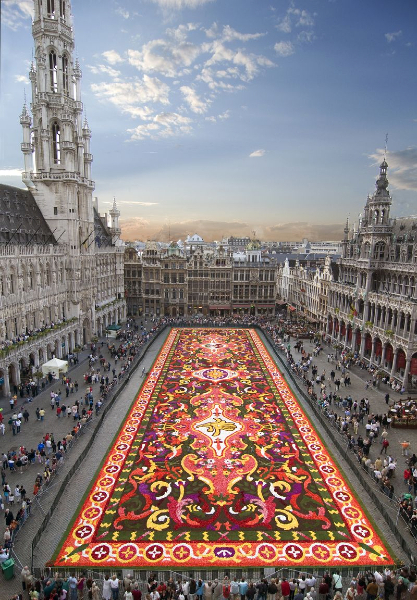 In precious threads, rare designs and colours, these masterpieces expand one’s knowledge and satisfy the curiosity of those who come to see the famous Flower Carpet. They are graciously deployed here by the internationally famous Maison Sadraee. 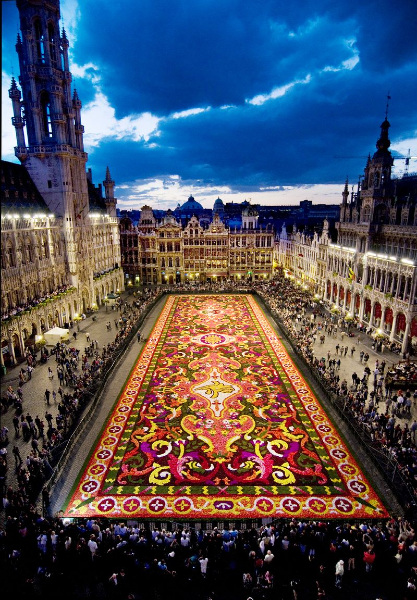 And as no novelty ever travels alone, the Flower Carpet will come alive every evening under the baton of Grégoire Dune. This new and original show, all in music and light, will be staged live as of the official inauguration, on 14 August at 10:00 PM, then rebroadcast every evening at 10:00, 10:30 and 11:00. The name of this famous French workshop comes from the establishment where it was founded in 1627 by Louis XIII, on the current location of the Palais in Paris. At that time, continuous wars had led the kings of France to relocate the prestigious craft on their territory. 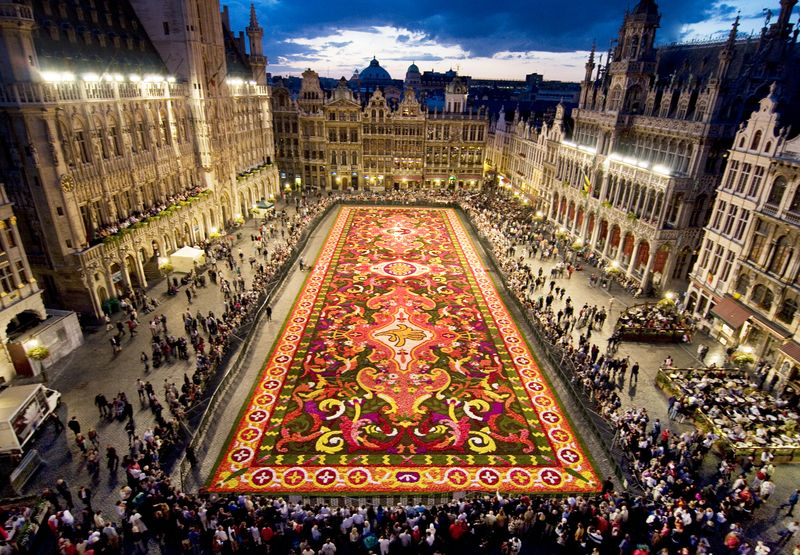 Henri IV had even simply prohibited the import of foreign tapestries as of 1601. There was no question then of drawing inspiration from Persian, Caucasian or Turkish patterns. 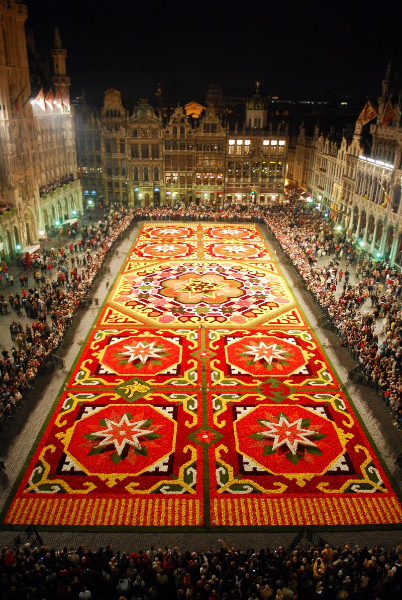 The designs of French carpets rapidly adopted a style where floral and plant patterns, mixed with royal and, inevitably, Christian symbols. The fleur-de-lys, for example, summarises the Holy Trinity with its three petals. It had been adopted by the kings of France since the Middle Ages, and exalted by the Bourbon dynasty all the way to Spain. The particular, eight-pointed cross of the Templars refers to the cosmic balance, the resurrection and the New Testament. The Savonnerie craftsmen excelled in the precise and delicate way they practiced their craft. They knotted coloured fibres on their vertical looms, pressed them with a comb, and cut them with bent scissors. The finest work can comprise up to 60 knots per cm², guaranteeing an incomparable velvety feel. 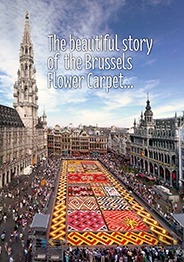 Here then, in a few words, the origin of the Flower Carpet 2008. Perhaps future editions will draw inspiration from Gobelins, d’Aubusson, a modern or contemporary designer? 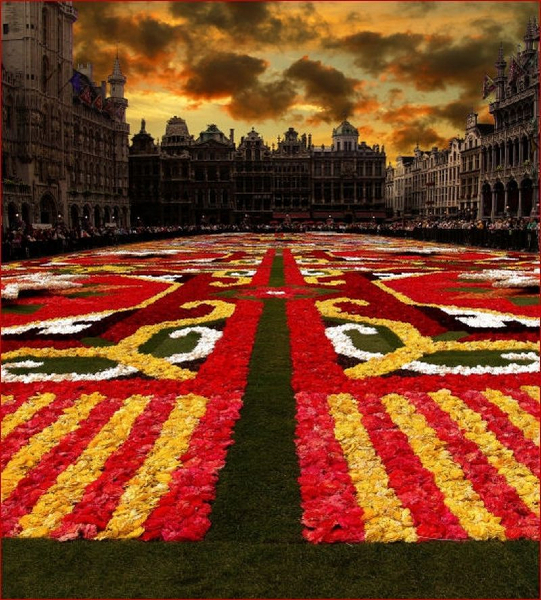 This is precisely where the appeal of this extraordinary floral composition lies: the final revelation of its mystery! 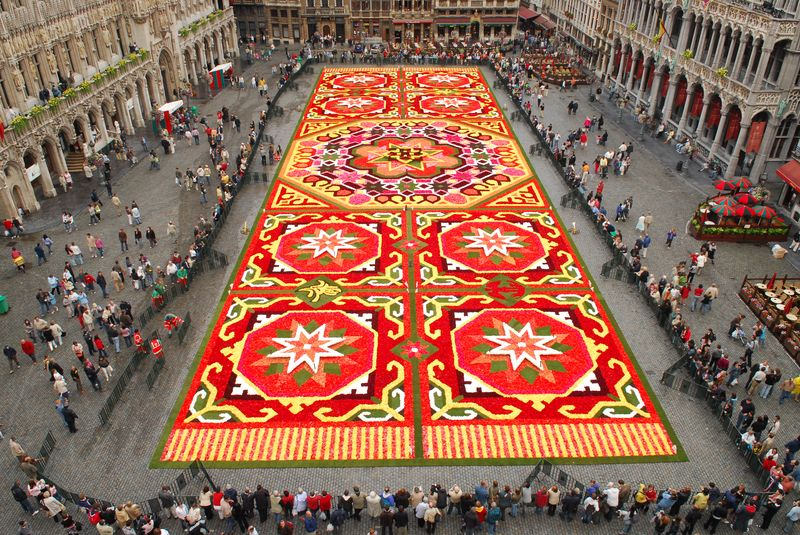 Other natural elements will be called upon to render the more particular colours of this glimmering Flower Carpet. Dahlias will take the place of blue entrelacs. The green will be grass, and tree bark will render the brown nuances that form the background of the carpet.